This statistic shows the number of employees of the Big Four accounting / audit firms worldwide in 2018. PwC employed 250,930 members of staff in 2018. 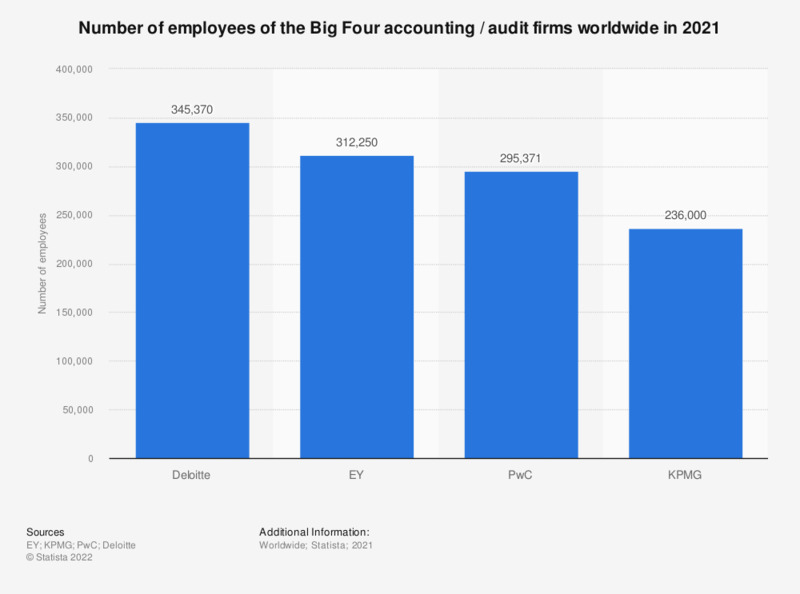 The “Big Four” are the four global leaders in auditing and accounting. Deloitte, PricewaterhouseCoopers (PwC), Ernst and Young (EY) and KPMG together audit the majority of publicly traded companies worldwide. In 2018, Deloitte employed the largest number of people with more than 286,200. Founded in London in 1845 and headquartered in New York today, the company employed the largest share of its staff in the Americas, closely followed by Europe, the Middle East and Africa. Combined, the “Big Four” employed just over one million people worldwide in 2018. Deloitte was the largest auditing firm out of the four in terms of revenue in 2018, although PwC was now far behind - generating almost two billion U.S. dollars less. While Deloitte made the largest share of its revenue in the Americas, Amsterdam-based KPMG’s revenue was the largest in Europe, the Middle East and Africa. Two of the leading auditing companies unsurprisingly made much of their revenue from their auditing, assurance and audit and enterprise risk services (AERS) sector. Among other things, the companies also specialize in tax and advisory or consulting services. Fiscal years: Deloitte ends May 31; PwC and EY end June 30; KPMG ends September 30.